Dining etiquette is often taken for granted, but if individuals are interviewing for jobs, networking or conducting business over a meal, they cannot. Minot State University offered an Etiquette Luncheon Oct. 11 to expose students, faculty and staff to the basic principles of traditional etiquette used during a business meal through hands-on interaction. At her table, Urosa Khalid conversed with MSU President Steven Shirley. Khalid is a junior majoring in clinical laboratory science. To commemorate Disability Awareness Month, the Minot State University Diversity Council, the North Dakota Center for Persons with Disabilities, and MSU disability services are sponsoring an interdisciplinary social Oct. 17 in Memorial 114, 5-7 p.m. The social will feature “States of Grace,” an award-winning documentary. The film denotes the journey of Dr. Grace Damman, a revered physician, and her family following her surviving a near-fatal head-on collision on the Golden Gate Bridge. After the film, Becky Daigneault, NDCPD research associate, will facilitate discussion. The social is a free, casual event, with no registration necessary. It will benefit all disciplines and all majors. For questions, contact Evelyn Klimpel, disability services coordinator, at evelyn.klimpel@minotstateu.edu or 858-3371. Minot State University Program of Theatre Arts presents Brian Friel’s “Dancing at Lughnasa,” directed by Angela Schnaible, theatre instructor, in Aleshire Theater Oct. 19-22 at 7:30 p.m. Doors will open at 7 p.m.
“Dancing at Lughnasa,” winner of the 1992 Tony Award for Best Play, is about five Mundy sisters in the fictional town of Ballybeg, Ireland. Kate, the eldest and a teacher, is the family’s main wage earner. Her younger sisters, Agnes and Rose, knit gloves to sell for supplemental income. Maggie provides comic relief. The story is told from the perspective of their nephew, Michael. For tickets, contact the MSU theater box office at 858-3172. Seating is general admission only. Tickets are $10 for adults; $5 for seniors and 18 and under. Admission is free for MSU students, faculty and staff with a current MSU ID. Reservations are strongly encouraged. Minot State University will enshrine three individuals and one team into its Athletics Hall of Fame Oct. 22. The 2016 Hall of Fame class features former student-athletes David Blake (wrestling), Courtney “CoCo” Haley (men’s basketball) and Melissa Spelchen (volleyball/softball) along with the 1992 MSU football team. MSU will honor the inductees at a brunch Oct. 22 at 10:30 a.m. at the MSU Conference Center. Ticket prices are $20 and may be purchased from the MSU Athletic Office at 858-3041 by Oct. 17. The Hall of Fame induction ceremony is during halftime of the Beavers home football game against Minnesota Crookston, with kickoff slated for 1 p.m. This marks the 37th class to enter the Minot State Athletics Hall of Fame as the school has honored a class each year since 1980. 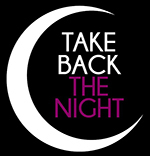 Take Back the Night, a walk to create awareness of and provide information about violence, is set for Oct. 27 in the Beaver Dam beginning at 7 p.m. Minot State University’s Title IX Office, the Domestic Violence Crisis Center, and the Student Social Work Organization sponsor the event. For the walk around campus, luminaries will provide light for the path. Participants return to the Beaver Dam, where they will listen to a survivor’s story, view videos and enjoy refreshments. For questions, contact SSWO at sswo@minotstateu.edu. Minot State University will host Joint Services Transcript Evaluation Training Nov. 3 in the Conference Center (Student Center, third floor), 8 a.m.-4 p.m. The training is open to all faculty, staff, and administrators from public, private and tribal colleges and universities in North Dakota. Andy Heitkamp, MSU Veterans Center director, organized the event. Sponsors include the MSU Veterans Center, the Multi-State Collaborative for Military Credit, and the Midwest Higher Education Compact, with funding from the Lumina Foundation and USA Funds. For questions, contact Heitkamp at 858-4002 or Andy.Heitkamp@minotstateu.edu. 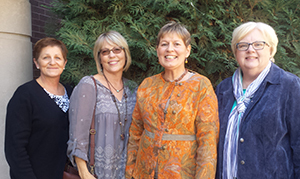 Kirsti Henriksen, associate professor and international coordinator in the Bachelor Nursing Programme at Tromso campus of the Artic University of Norway, visited the Minot State University Department of Nursing Sept. 27. She toured clinical sites and the nursing program with MSU nursing faculty, noting differences and similarities in nursing roles, responsibilities, use of technology in education and health care, and educational preparation of nurses. The visit concluded with a presentation by Henriksen regarding the region of Tromso, Norway, the Bachelor Nursing Programme, and the profession of nursing in Norway. Pictured, left to right, are Nicola Roed, MSU Department of Nursing chair, Diane Sjol, MSU associate professor of nursing, Kirsti Henriksen, and Linda Schaefer, MSU assistant professor of nursing. Oct. 12-28 — “Regando el Maíz y el Nopal (Watering the Corn and the Cactus),” etchings by artist Marco Hernandez, best-of-show winner from Americas 2015: All Media juried competition, Library Gallery. Oct. 12-Nov. 10 — “Nuances,” collaged monotypes by North Dakota native Michelle Lindblom, Hartnett Gallery. Andrea Donovan, professor in art history and humanities, has a show of her paintings in the lower gallery of the Taube Museum of Art in downtown Minot. “The Glow of Nature,” a series of acrylic landscape paintings, is Sept. 13-Oct. 14 with a closing reception Friday (Oct. 14) from 5:30 to 7 p.m., which is free and open to the public. The Taube Museum of Art is open Tuesday through Friday until 5:30 p.m. and on Saturday from 11 a.m. to 4 p.m. Guy Hanley, assistant professor of science and curator of collections, was unable to attend the International Congress of Entomology in Orlando, Fla., Sept. 25-30 due to budget cuts. But he sent a workbook with his co-author, Ron McPeak, detailing recent research on revising the scarab beetle genus Coenonycha. Guy's work and detailed imagery will facilitate researchers ability to easily and reliably identify specimens. Guy anticipates a publication of this research in the fall of 2017. Deanna Klein, Department of Business Administration chair and business information technology professor, received the Ben Bauman Award of Excellence at the International Association for Computer Information Systems Conference Oct. 5-8 in Nashville, Tenn.
Dionne Spooner, assistant professor of social work, had her dissertation study, "An exploration of male batterers' perceptions of a standardized batterers’ treatment program," accepted for presentation at the 20th Annual American Association of Behavioral and Social Sciences conference Jan. 30-31 in Las Vegas.